Attorney Hanif Hirji graduated in the top 5% of his class at Loyola Law School in Los Angeles, was an editor in law review, and earned other honors while in law school. 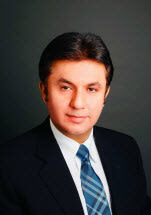 He also has degrees in accounting and taxation from the University of Southern California. While at Loyola Law School, he was one of the few select students who obtained an externship with the Los Angeles District Attorney’s Office in Los Angeles and Pomona where he was certified to handle numerous cases for the prosecution providing him with first-hand experience of being able to evaluate both sides of a criminal case. His work experience includes working for a large law firm (Sidley & Austin), an international C.P.A firm (Arthur Young), other private companies as well as his own entrepreneurial start up businesses. This extensive educational, work and business experience allows Attorney Hirji to properly evaluate your legal circumstances and to assist you in a wide array of matters including criminal defense, immigration issues, bankruptcy relief, as well as business and franchise law.